Glad you asked. Find answers to FAQs on Victoria, Vancouver Island, British Columbia and Canada below. Victoria has the mildest climate in Canada. Greater Victoria is one of Canada's driest areas, with an average snowfall of just 25 centimetres (9.75 inches) and an average rainfall of 592 millimetres (23 inches), less than recorded precipitation in Vancouver, B.C. or Seattle, Washington. Summers are pleasantly warm (but not too hot) and the winters are mild. Q: Is it easy to get to Victoria? Yes. Victoria and Vancouver Island are extremely accessible. More than 50 flights from Vancouver and Seattle land daily at Victoria International Airport, in addition to many direct flights from major Canadian and U.S. cities. It’s now easier to get to Victoria than ever before, with harbour-to-harbour flights from Seattle and Vancouver, by float plane or helicopter, plus there’s an efficient ferry system between Victoria and the mainland. For more information, check out Getting Here. Q: How long are the ferry rides? Ferry departures and travel times are below. Q: How large is Victoria? 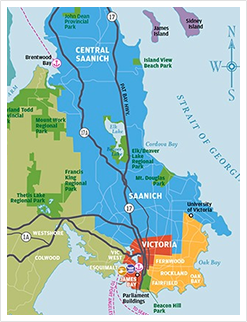 Greater Victoria covers an area of 695.35 square kilometers. The City of Victoria's population is 85,792 (2016). The Capital Region population is 392,000 (2017). The population of Vancouver Island is 799,400 (2016). Q: What’s Victoria’s main industry? Victoria's primary industries are information technology, tourism and government. Q: How many parks are there in and around Victoria? 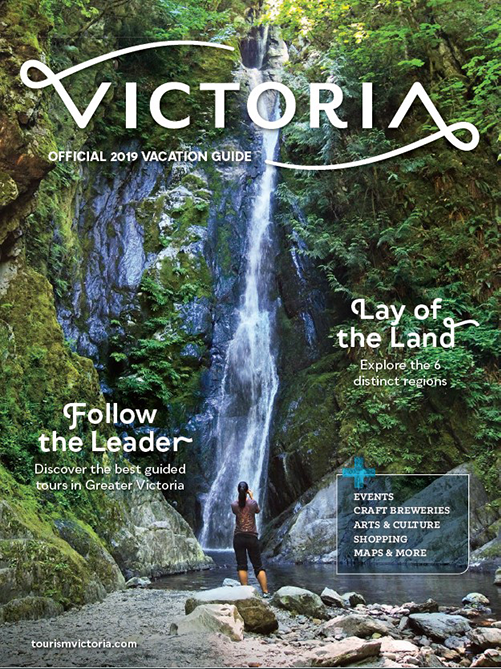 There are 48 regional, provincial and federal parks in Greater Victoria, totaling more the 7,600 hectares (22,724 acres). Q: When was Victoria established? Victoria was established as Fort Victoria in 1843 by the Hudson's Bay Fur Trading Company and was incorporated as a city in 1862. Q: What is the City of Victoria's motto? Q: Where is Vancouver Island and how big is it? Vancouver Island is the largest island off the west coast of North America. Tucked against the mainland coast of British Columbia and the north shore of Washington State's Olympic Peninsula, Vancouver Island occupies an area about the size of Holland. The island stretches 500 kilometres (320 miles) southeast to northwest with an area of 3,175,000 hectares and 2,150 miles of coastline. It is separated from Vancouver, B.C. by the Strait of Georgia to the east and from Washington State, U.S. by the Strait of Juan de Fuca to the south and southeast. Vancouver Island is actually closer to the United States than mainland Canada. Q: What’s the geography like on Vancouver Island? Vancouver Island terrain is diverse and includes sandy beaches to rugged coastlines, marshy lowlands to rolling farmland, and lush, old-growth rainforests to snow-capped mountains. Q: What’s the capital city of British Columbia? Q: How large is British Columbia? 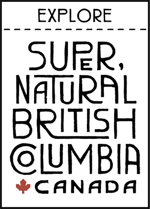 British Columbia (B.C.) is Canada's third-largest province, and occupies about 10% of Canada's land surface. While B.C. is nearly four times larger than Great Britain and 2.5 times bigger than Japan, its population of 4.8 million is 14 times smaller than Britain's and its land mass is a little more than one-third the size of India.